Last week during HP’s Workstation International Media Event in Santa Monica, Los Angeles there were a lot of interesting news and product announcements from HP, but one thing has caught my eye especially, since it was a stereo 3D related product. I’m talking about the HP 2310g LCD display that was been showcased at the event along with a HP Z400 workstation (have in mind that the HP 2310g 3D-ready monitor is a consumer-oriented product, not a professional one! ), but let me tell you what is interesting about this product. HP 2310g is a 23-inch 120Hz 3D-ready LCD monitor with Full HD resolution that works with Nvidia’s 3D Vision active shutter glasses, but will probably also be compatible with other active shutter solutions when/if they come later thus year. 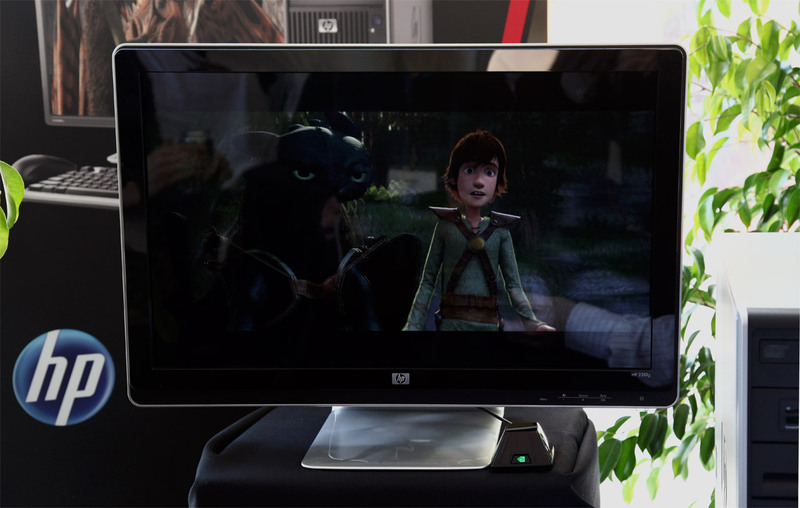 Here is a short video I made at the event showing the HP 2310g display in action playing a stereoscopic 3D trailer of the movie How To Train Your Dragon in 3D by DreamWorks. As you can see this display does not rely on matted screen, but instead uses glossy surface, resulting in some reflections being visible on the screen. Just have in mind that the demonstration was pretty much outside on a bright sunny day and a lot of external light is coming all around the screen (not very good conditions for a glossy display), so in normal at-home usage the reflections on the screen should be much less or none at all. Besides the disadvantageous possibility of annoying reflections the glossy display also brings some advantages like better color reproduction and contrast of the image, along with better viewing angles. 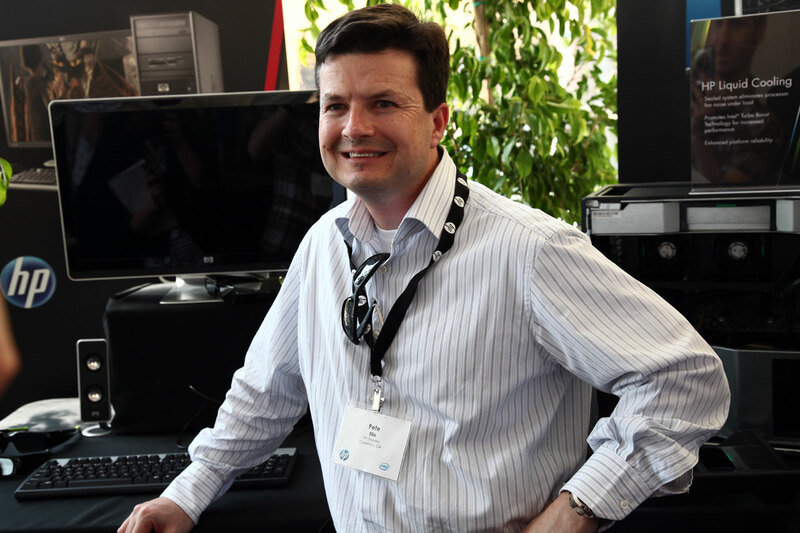 Pete Ellis from HP Displays Business Unit (on the picture above, in front of the HP 2310g display) was available during the demonstration to answer some questions about the 120Hz display. I’m sure the first question you are going to ask is when to expect the monitor on the market and what will be the price? Unfortunately there is still no release date announced or pricing for the display, but it will most likely be available on the market before the end of this year and should not cost more than the currently available alternatives from other companies. So the HP 2310g 120Hz LCD display has a 16:9 aspect ratio and Full HD resolution of 1920×1080 pixels and will supposedly be with a 2ms response time and 400 cd/m2 maximum brightness level. Have in mind that these are not official specifications and since the product is not yet available on the market it might be a bit different when it becomes available. Where can we get the 3d trailer for How to Train your Dragon ???? Bloody, I’m highly skeptical about any future LCD panel providing a significant improvement over the current Alienware and Acer models. Unless there is some refresh time advantage that can be gained by using an S-PVA or IPS monitor to eliminate the confounded ghosting! From early reports, it sounds like plasma is going to trump LCD. Consumer Reports put the Panasonic 3D plasma TV up against Samgung’s 3D LCD TV, and the plasma was ghost-free, whereas the Samsung was not. We also need a monitor that has higher resolution than just 1080P. That resolution is mediocre compared to the 2560 X 1600 pixel monitors that gamers and photo editors have been using for years. David G., there are still a lot of improvements possible… the key to start having these is for the S3D to really go mainstream. I hope that this time it will finally happen and the technology will get its long deserved attention from all manufacturers… and not only for 3D TVs, but also for computer displays, HMDs etc.